Scuderia Ferrari, Formula 1's most famous team, has pledged to better research possible race strategies following their disastrous conclusion to the 2010 season. With their lead driver, Fernando Alonso, leading the standings going in to the final race he was every seasoned pundit's tip for the title until a poor call from his team left him stuck in the midfield unable to overtake enabling German driver Sebastian Vettel to cruise to the win and clinch the title with a comfortable points margin. "I cannot believe their stupidity." Ferrari support Chuck Hankman declared on an Internet forum, "It was obvious, five laps after his pitstop, that he was going to be stuck behind Petrov. They should never have called him into the pits. If Garmin or TomTom sponsor the team then Ferrari should drop them immediately � with traffic management like that you can be sure I'll never be using their products again." Although there were many elements of the race that Ferrari had failed to pay attention to, the most notable factor was rookie Russian driver Vitaly Petrov, who managed to hold up double World Champion Fernando Alonso for almost the entire duration of the race. Ferrari were extremely surprised that Alonso was unable to find a way past the Renault driver after following him for 40 laps. Renault were even more surprised at the situation, with one engineer remarking that 40 laps might even be a record for his car staying on the circuit. "It is ironic that everyone is calling this incident Petrov-gate" World-renowned F1 Pundit Ben Dickson explained, "If he had been a gate then maybe he'd have let Alonso through. Petrov-fence would probably be a more appropriate name for it." Ferrari have acknowledged their error and have implied there will be major restructuring of the team as a result, and say that now permutations they had never considered will be programmed in to their strategy computers. "If we failed to predict that Petrov could hold up Alonso then it opens up almost limitless possibilities for what we have failed to consider," Team Principal Stefano Domenicali revealed, "Maybe Valencia will produce an interesting race? Maybe Jenson Button will have a race weekend where he has grip and no vibrations? Maybe Eddie Jordan will manage to walk past Bernie Ecclestone without using the words 'the Master' or 'absolute genius'... as far as Ferrari is concerned, anything is possible now." Ferrari have confimed Domenicali's assertion that 'everything is now on the table' as far as race predictions are concerned, including the possibility of a dinosaur attack. Following Ferrari's failure to predict the events of Abu Dhabi, they are now considering absolutely every possibility. "We realise that dinosaurs are extinct, and it would be unlikely that one could keep pace with a 200mph Formula 1 car, but like I said: EVERYTHING is on the table. We are even considering the possibility that Sebastian Vettel will pull off a sublime overtaking manoeuvre." 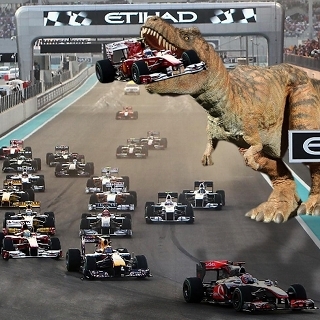 Dinosaur attacks are obviously not something that the Formula 1 officials have documented procedures for, the FIA � the sport's governing body � maintained that the regulations were more than adequate for dealing with such an occurrence. While their spokesperson could not give a detailed description he did concede that in the event of a dinosaur eating one of the competitors, it would probably necessitate the Safety Car to be deployed. Ecclestone Unveils 2010 Edition of "Bernie's Crazy Idea!"